The Sloggi Control Maxi is a full cut brief with a reinforced tummy control panel that flattens and smoothes for a shapely figure. Its classic style and soft fabric make it suitable for everyday wear. 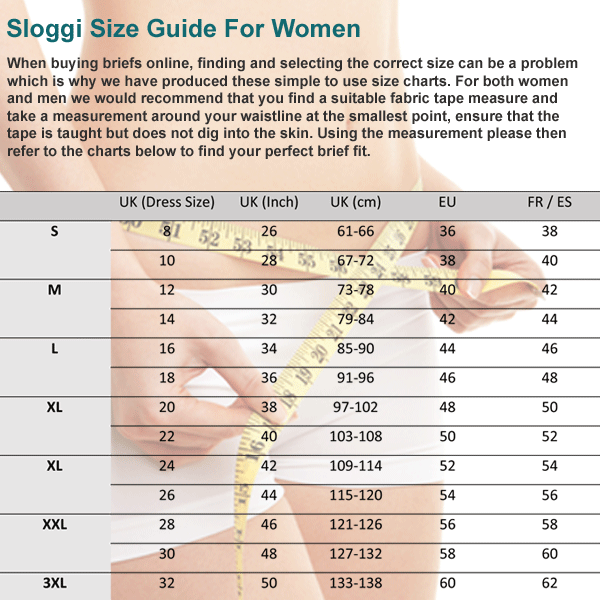 The Control Maxi is one of the most popular choices in the Sloggi Control range of comfortable, flattering shapewear. These Maxi knickers give excellent coverage for the abdomen and waist, but their big secret is a reinforced V-shaped panel at the front that shapes and smoothes your tummy. This classic control knicker is cut from soft, stretchy cotton/Lycra in Black, White, or mid-beige Poudre. We know how much you love the Sloggi Control Maxi, so we’ve made it available in a 2-pack as well!. Comfortable and supportive without looking unattractive - the only pants for me! Worth the money every year. Love love Sloggi pants, have been wearing them for years. Had a wedding coming up and bought these control pants. Wasn't disappointed in the comfort, they were brilliant but in my opinion just not strong enough to hold you in properly. They were just like thicker Sloggi pants . Lost a star for that but otherwise would have been perfect. I love the design of these briefs, comfortable and neat. Just wish they weren't so pricy! An excellent service - thank you. Very comfortable pants, at a very good price. Also supports the tummy where needed.